The digital flier for the Christmas event, showcasing the neoclassical Georgian building in which we now work. After six years at my previous studio at St Margaret’s House in Edinburgh, I recently moved to Custom House in Leith; a stunning neoclassical pillared building that is a central landmark on the Leith landscape. After a prolonged period as the National Museums of Scotland’s storage facility, this A-List Georgian building is now being managed by the Scottish Historic Buildings Trust who are encouraging a wide variety of creative people to build a new hive of activity in the heart of Leith. There are two distinct buildings on the site: a the larger, more grand building situated on the corner of the Commercial Street and the Water of Leith, and the “cruiser” store, located behind the main building on a narrow cobbled lane that has been hidden from view for years. My new studio backs directly onto this lane via an extremely handy loading bay and this provides me with much better access for loading my often bulky murals. 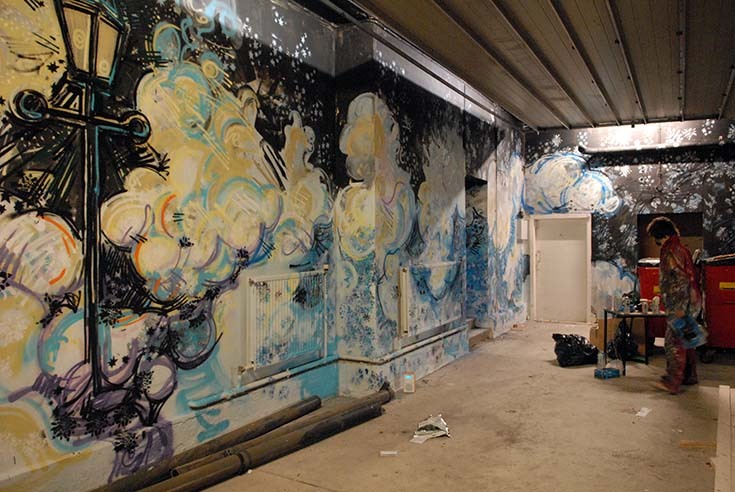 Even more exciting however is the nascent creative community that is burgeoning within the space. The Christmas event on 17th and 18th December was the first open studio day that I’d been involved in at the Custom House since the move and therefore I thought I’d celebrate by undertaking my first live painting event in the new space. Studio manager Sheila Masson at work covering the walls of the loading baywith an undercoat of emulsion. The loading bay makeover fully underway as it is transformed into a Narnia-themed space. 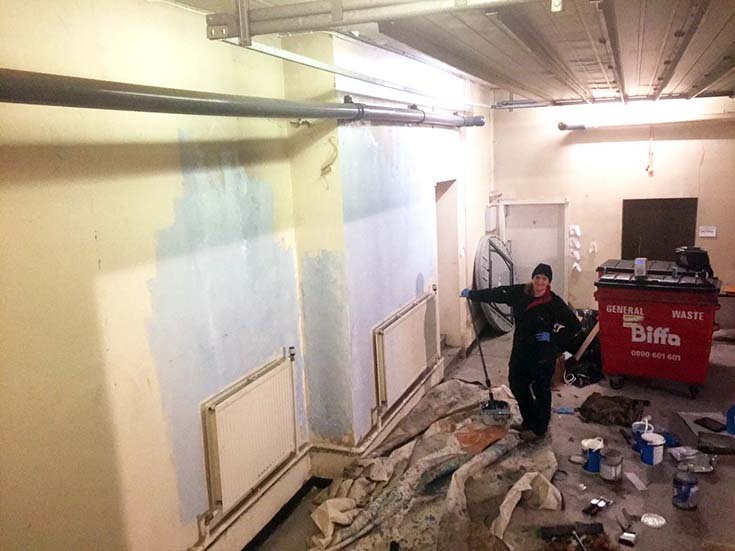 The large loading bay was an extremely bland and tired-looking area so with the blessing of SBHT Director Una Richards, we set out to give it a seasonal makeover. As our new studio opens directly onto this space, I felt it was extremely important it project the creativity and joy that the new building and its new tenants aspire to. 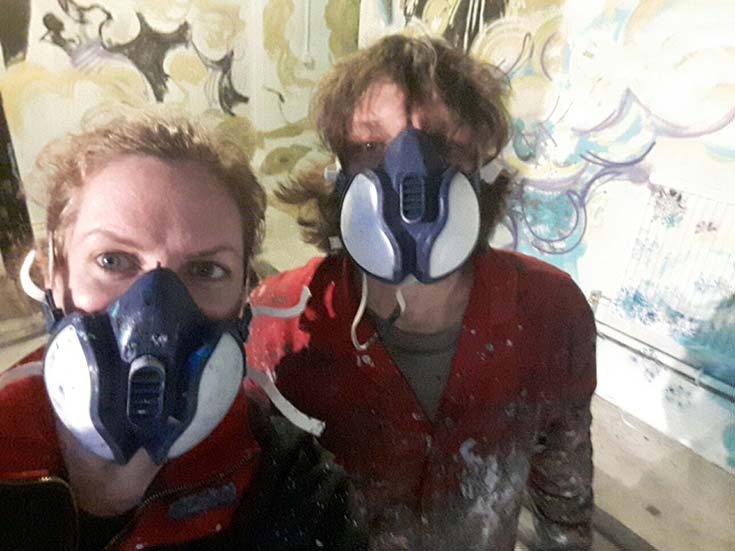 I enlisted my studio manager Sheila Masson – a talented artist (as well as a powerful brain) and we started work on the Wednesday afternoon, priming the space in preparation for our plan. Sheila and Chris adhering to health and safety during extensive spray work in the loading bay. A gigantic Aslan appears out of the snowy landscape in the loading bay. Sheila flexing her muscles on the scaffolding as she applies spray painted hand-cut stencils late into the evening. 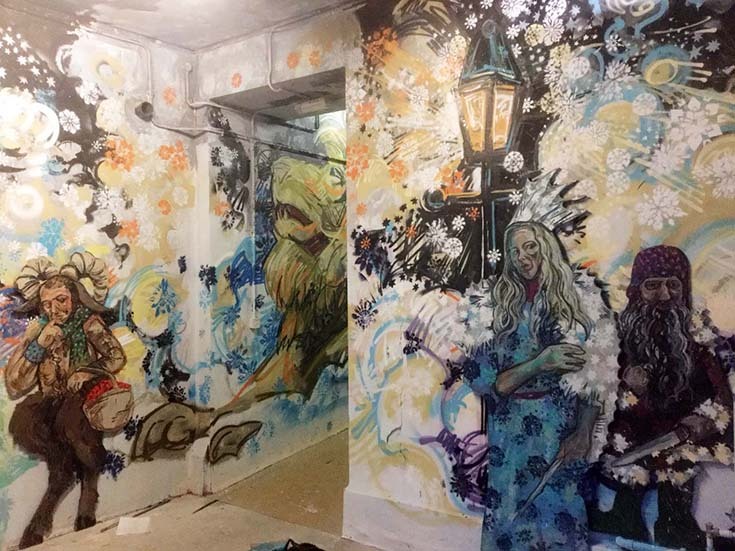 We decided to paint a Narnia themed mural as although there is a Christmas element to the story, it does not define it, so therefore the mural will remain relevant till spring. 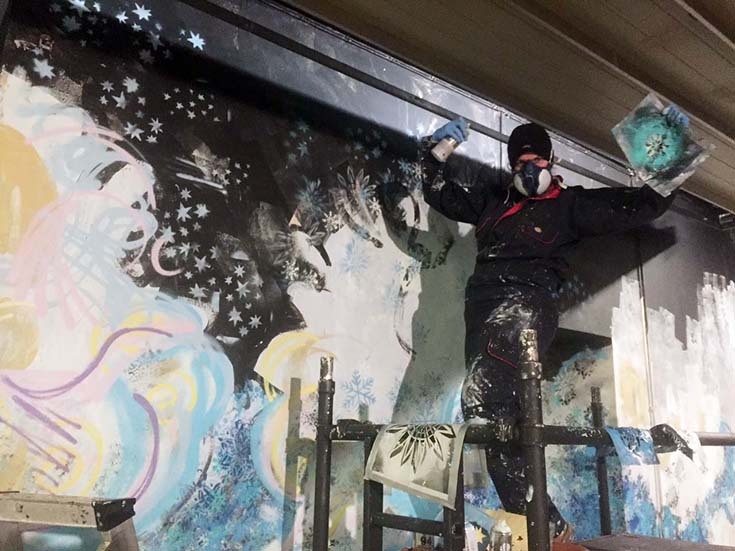 We spray painted a snowy landscape with a large scale Aslan and the ubiquitous lamp post front and centre. 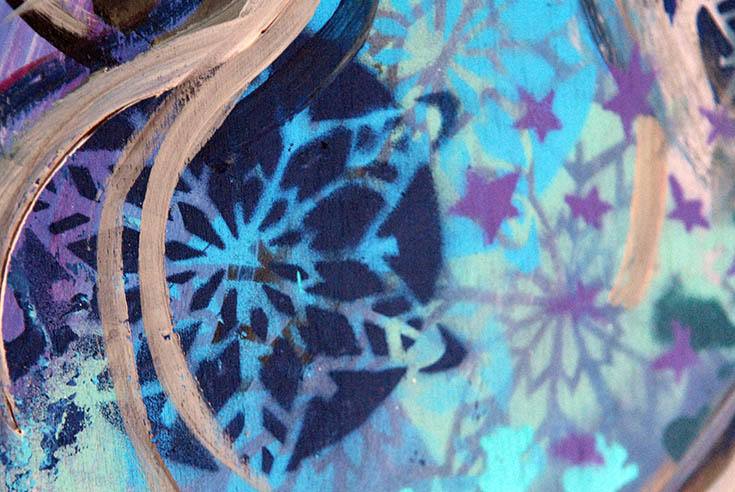 Sheila made a number of beautiful snow stencils that really set the tone and we quickly built an atmospheric frosted landscape. 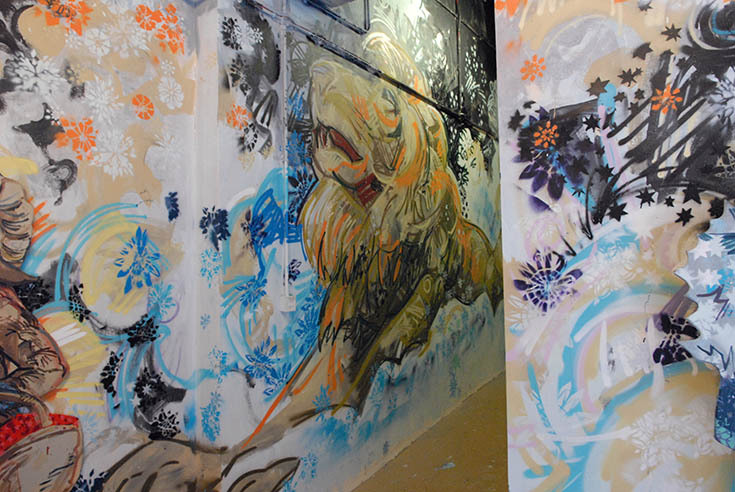 Detail of some of the stencilling and freehand collaborative work that Sheila and Chris created on the loading bay walls. Come the main event on the Saturday however it was important that we kept spray paints to a minimum due to the health and safety issues (and the pong!). 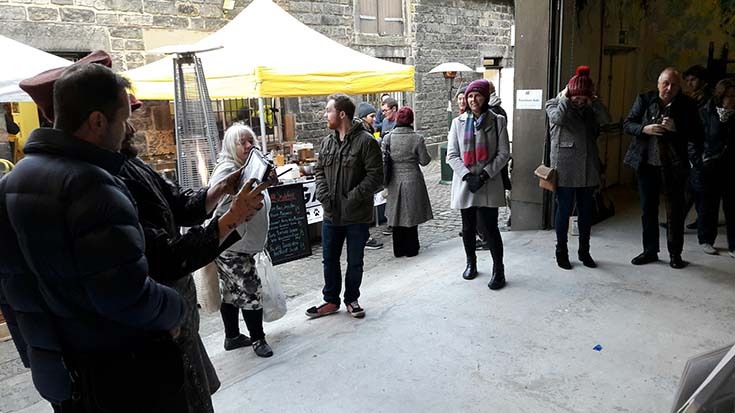 The alley was filled food stalls and visitors to the building as well as regular Leith Farmers Market shoppers who wandered into the newly revealed space. Visitors to Leith Custom House wandering through the loading bay and out into Custom Lane, where they could enjoy hot food and do a spot of Christmas shopping. 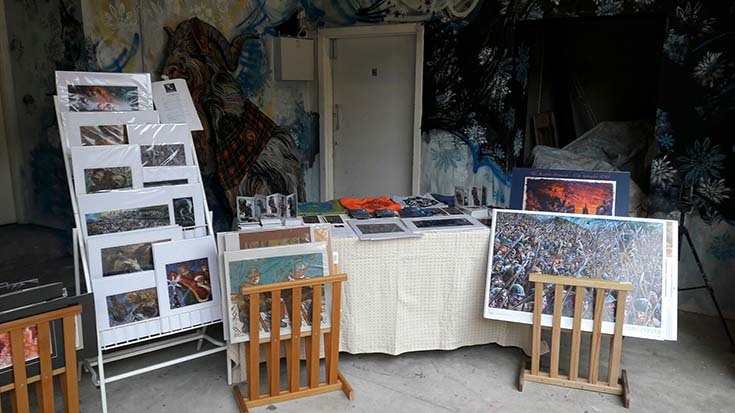 We also set up a stall of our own posters, prints, postcards and t-shirts (also available on our website if you missed out!) which were very popular for Christmas presents. 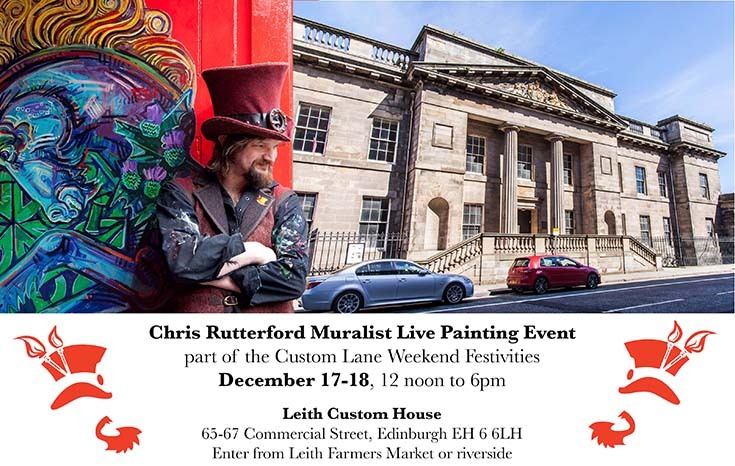 Chris painting life size cut outs during the Christmas event at Leith Custom House. 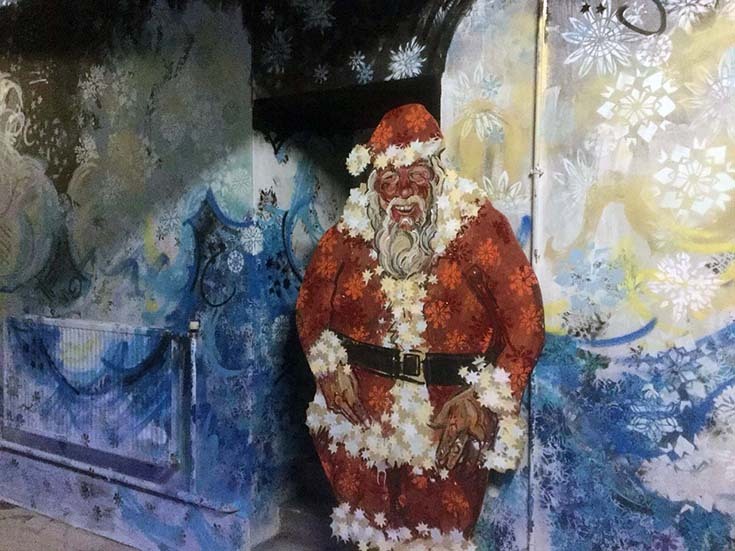 Santa nestled in the loading bay. Moving on from the spray painted walls I changed my focus to shaped life size characters from the book, cut from large sheets of wooden board. I snared a few tenants and SHBT friends to pose for the The White Witch, her dwarf, Mr. Tumnus and a large scale Santa. To keep the characters on theme and to compliment the visuals in the loading bay, I reused Sheila’s stencils to add surface detailing. The end result had a vibrancy reminiscent of textile design or a Rauschenberg painting. 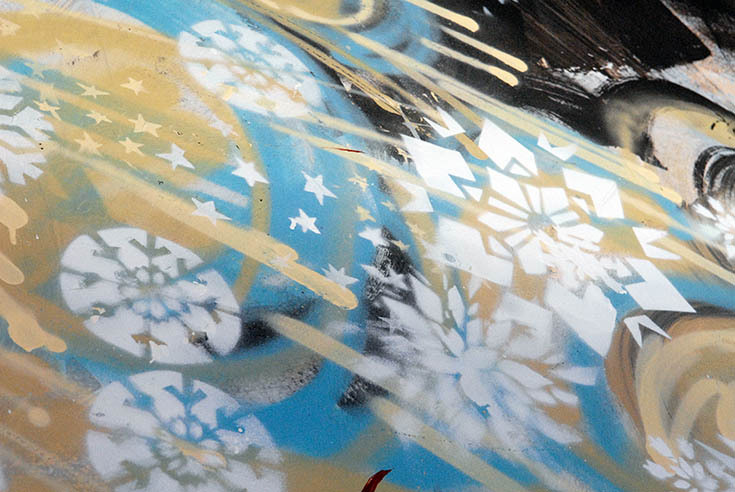 Detail of the White Witch’s dress which utilises some of the stencils that Sheila made for the loading bay walls. 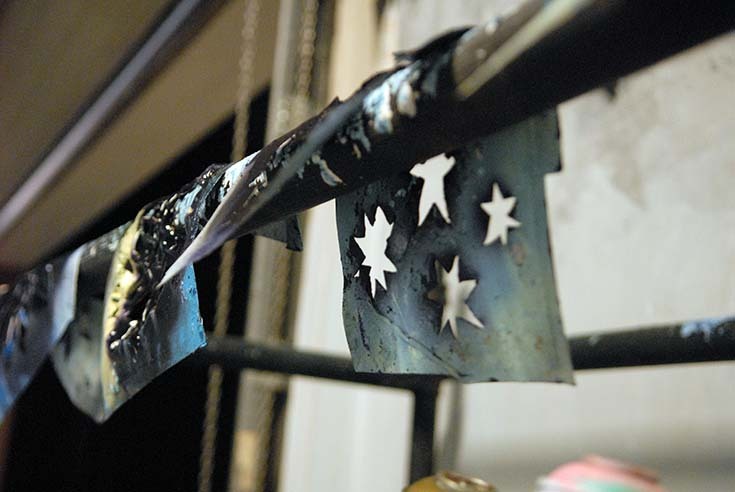 Stencils drying on the scaffolding during the painting of the loading bay. 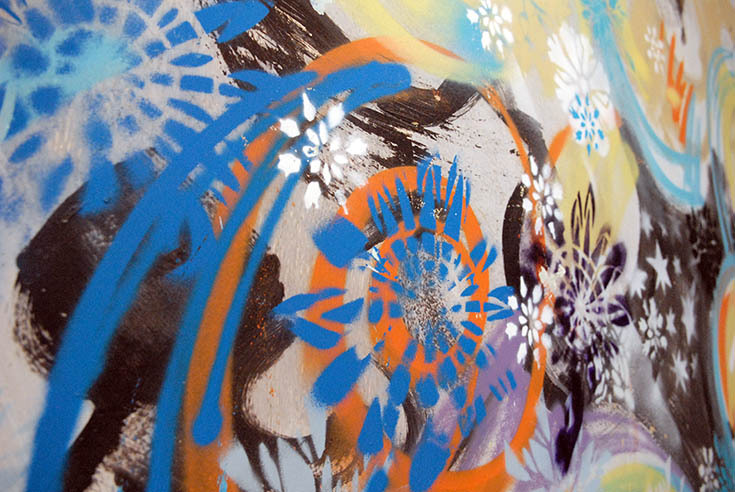 The joy for me in collaboration is that every new partner brings fresh tools to the army and in this way Sheila’s stencils and application to the cause really enriched the product and added a further depth and subtlety to my directness and drive. 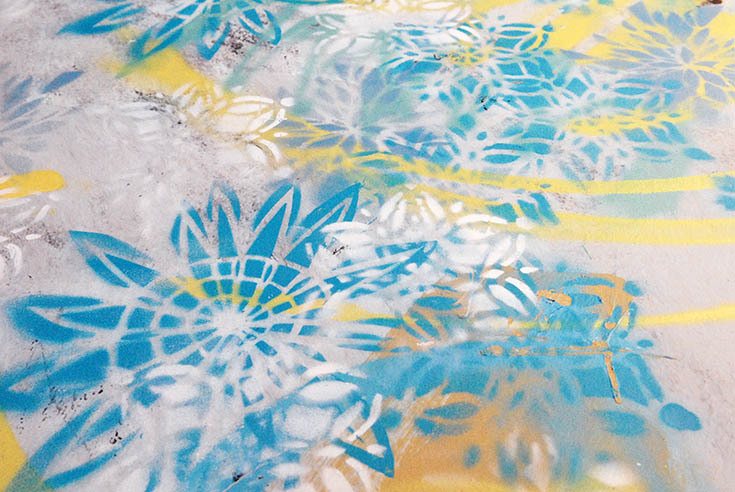 Interaction between Chris’s freehand and Sheila’s stencilled spray work. Three of the Narnia cut out characters inserted into their virtual stage set in the newly painted loading bay. 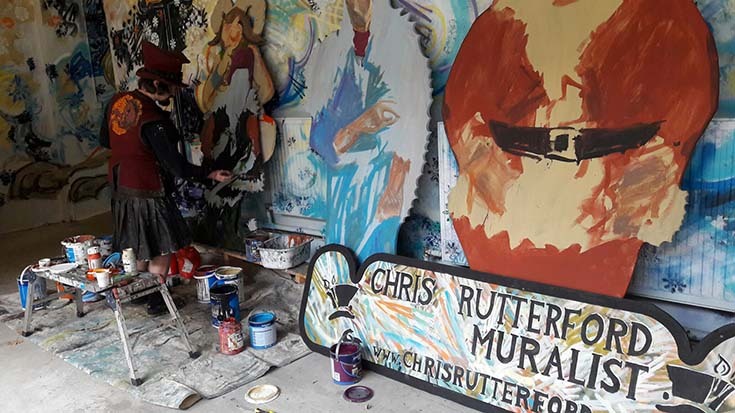 The loading bay mural is now established and the plan is to periodically adapt the visuals over the coming months and years. The hope is the magic will be infectious and over the coming years the building will permanently acquire some of the magic of Narnia.